When its all said and done, Anastasija Sevastova might go down in history as the athlete with the best comeback story. The Latvian professional tennis player, who retired from the game in 2013 has been able to make a sensational return to the sport and is well on course to win her first Grand Slam title after having captured a few WTA titles. Anastasija Sevastova was born on the 13th of April 1990 in Liepaja, Latvia. She began playing tennis at about the age of 6 after she was introduced to the sport by her grandmother. She played tennis for fun until she was about 15 years of age when she decided to make a career out of it. Her first notable game was in the Istanbul Cup in 2007 where she was able to win her first WTA match in the first round of the competition against Anastasiya Yakimova before going on to crash out in the next round. In 2009, Sevastova was able to qualify for the main draw of the US Open. She went on to win her first match in the Grand Slam tournament to further announce her arrival to the world of tennis. In 2010, the young Latvian was beginning to gain a reputation of being a giant killer as she defeated a Top 10 ranked player in the first round of the Monterrey Open. A few weeks later, she upset another top-seeded player at the Estoril Open before going on to win the title in her first ever appearance at a WTA final. In the 2011 and 2012 WTA tours, Anastasija Sevastova was slowly becoming a fan favorite as she put on performances that challenge her seasoned opponents. However, during this time, she suffered a number of injuries and illnesses that hampered her from achieving great heights. This made her call time on her career in May 2013. Sevastova’s time on the sidelines lasted for 19 months, after which she returned to the sport to make an appearance through a wildcard slot at the Sharm El Sheikh tournament in Egypt in January 2015. The year proved to be a somewhat successful one as she won four ITF tournaments and reached a WTA semifinal for the first time since 2013. In 2016, Sevastova who got rejuvenated in her break from tennis reached the Mallorca Open and Bucharest Open finals but however failed to win any. In the US Open later that year, she reached the quarterfinals of the tournament where she was knocked out by Caroline Wozniacki. Regardless of her not winning, her performances that year culminated in her achieving a new career-high ranking of 32. Anastasija Sevastova kicked off 2017 by reaching the third round of the Australian Open. She then got to two Premier-5 event semifinals before winning the Mallorca Open, her first WTA title since 2010. Her ranking went on to depict her winning as she rose to number 17. In 2018, she won her third career WTA title at the Bucharest Open and is hoping to bag her first Grand Slam at the US Open. 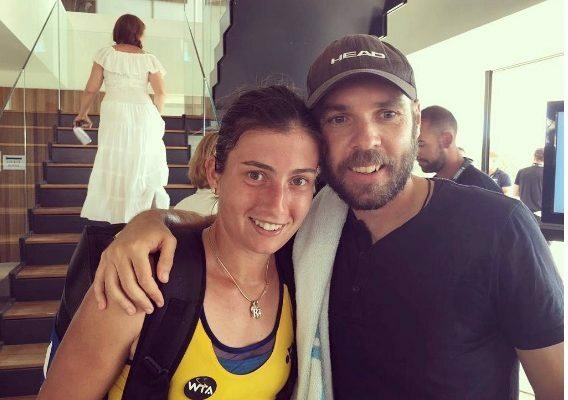 Nothing is known about Anastasija Sevastova’s father, however, her mother, whose name is Diana Golovanova, is an English teacher back home in Latvia. She shares the same birth name with Russian-Israeli singer and actress, Diana Golbi who rose to fame after winning the eighth installment of the Israeli version of Pop Idol called Kokhav Nolad. Sevastova’s mother was in the news in September 2016 after she for the first time in her daughter’s career, traveled to see her play at a Grand Slam. Golovanova proved to be the motivation her daughter needed as she pulled off an upset against the US Open’s No. 3 seed Garbine Muguruza. It was also the first time in her career that she beat a top 5 ranked player. Another notable person in her life worthy of mentioning is her coach and boyfriend, Ronald Schmidt. Schmidt, who was born on the 23rd of June, 1980, in Leoben, Austria, was responsible for overseeing his girlfriend’s return to playing tennis at the highest level after her long break away from the sport. The two have come a long way together and have managed to keep their personal life away from their professional one.